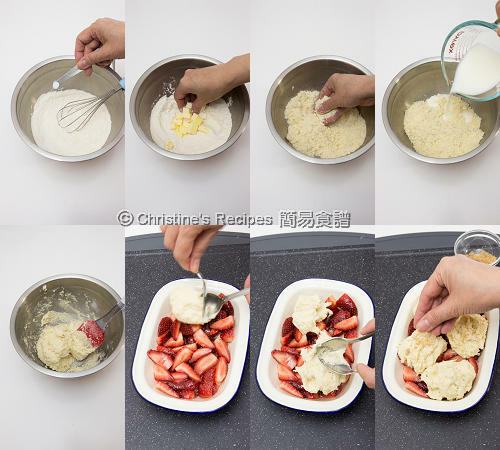 When I crave for an after-dinner-dessert, I often go for making a dessert made with strawberry. Strawberry is one of my most favourite fruits. Over the past two weeks, many large, good-quality and sweet strawberries are sold at a bargain price at the nearby supermarket. It's a very good reason to make a strawberry dish. To myself, a dessert enjoyed after dinner shouldn’t take too long to prepare. So I set the route on making a cobbler, that I’d call it an open pie, much easier to make than a traditional pie. All I need to do is to mix everything for the fillings. Then I can go for making the dough on top at ease. Don't knead or over-stir the cobbler dough. 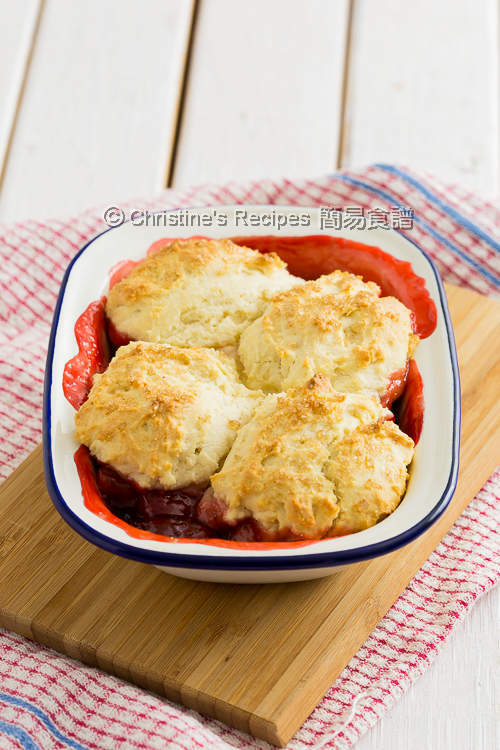 The cobbler crust looks like a scone with crunchy outside and tender inside, topping on delicious strawberry filling. At the moment I removed this dessert from the hot oven, the strawberry juice was so hot and expanded in volume. I was a bit excited to see the red filling almost spilling out from the rim of my baking tray. 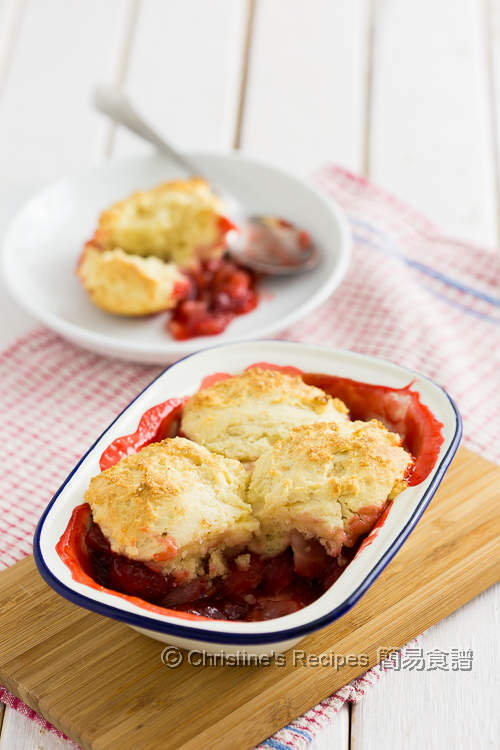 This strawberry cobbler is best served when hot. A scoop of vanilla ice-cream will take this dessert dish up a notch. Rinse strawberries under running water and wipe dry. Trim away the stems. Cut each into 4 wedges. Mix with sugar, corn flour, salt and lemon juice well. Transfer into a baking tray. Sift plain flour into a large mixing bowl. Mix in sugar, baking powder and salt. Add and rub in the chilled, diced butter with your finger tips into sand-like texture. Move quickly so that the butter won’t melt. Pour in milk. No need to knead. Just combine all the ingredients. The dough looks wet. It’s normal. 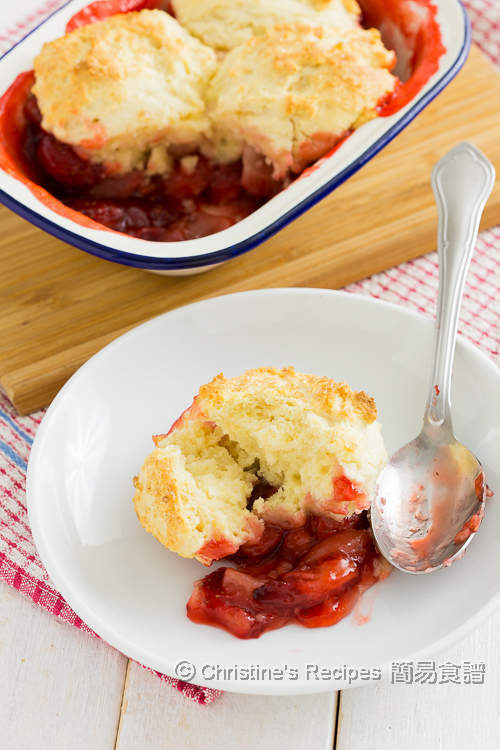 Use a large spoon to divide the dough into 4 portions and place on top of the strawberry mixture. No need to level the surface or make the dough even. Brush the surface with a little of milk. Evenly sprinkle raw sugar on top. Bake in the preheated oven for 40 to 45 minutes, or until the surface becomes golden brown. It’s done. Serve with favourite ice-cream if desired. Enjoy! Make sure not to over-mix the crust ingredients as you don’t want the crust becomes tough. 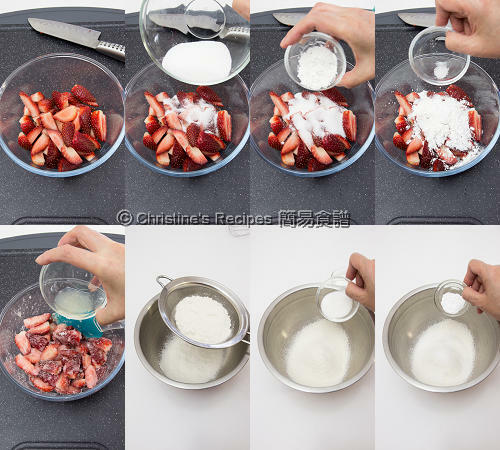 While baking, the strawberry mixture will increase in size, or even spill out from the baking tray. It’s best to place the baking tray onto a larger tray lined with foil to catch the strawberry juice. Either fresh or frozen strawberries will work with this recipe. You may replace strawberries with other kinds of berries. This is one of best dessert during the berry season!